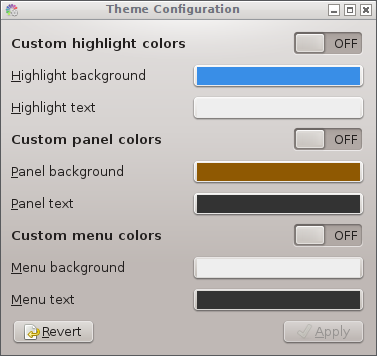 The tools and options for changing theme in GTK3 (not gnome). I have not seen any of those colors (other than gray) on my system anywhere with the default GTK3 theme therefore I have no idea what they actually apply to. Also, it is recommanded that the $HOME/.config/gtk-3.0/gtk.css file, if present, is kept empty. That last bit is interesting. I take it that with enough time one can turn gtk3 UI into something close to GTK2 in terms of appearance and usability via css. The tabs are way too big for whatever reason and only three fit in the window at a time, which is nowhere near enough. (scite:18507): Gtk-WARNING **: Theme parsing error: gtk.css:60:18: Not using units is deprecated. Assuming 'px'. (scite:18507): Gtk-WARNING **: Theme parsing error: gtk.css:60:20: Not using units is deprecated. Assuming 'px'. These really should only affect those specific declarations, not render the entire theme broken, but seems that it's not the case. The interesting aspect of this theme is that it fits many more tabs into the tab bar. Finally I found Clearlooks-Phenix which is a clearlooks port to gtk3. ... and looking for directories under /usr/share/themes. This appears to be a GUI tool to change themes. Unfortunately it does have gnome dependencies rather than GTK only.